The quality of herbal drugs is usually controlled using several tests recommended in a monograph. HPTLC is the method of choice for identification in many pharmacopoeias. If combined with a suitable reference material for comparison, HPTLC can provide information beyond identification and thus may simplify quality control. 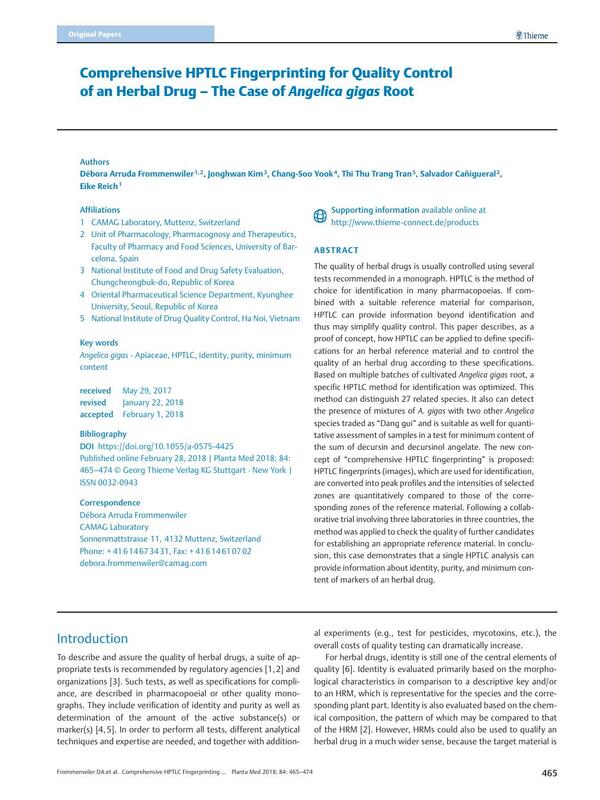 This paper describes, as a proof of concept, how HPTLC can be applied to define specifications for an herbal reference material and to control the quality of an herbal drug according to these specifications. Based on multiple batches of cultivated Angelica gigas root, a specific HPTLC method for identification was optimized. This method can distinguish 27 related species. It also can detect the presence of mixtures of A. gigas with two other Angelica species traded as “Dang gui” and is suitable as well for quantitative assessment of samples in a test for minimum content of the sum of decursin and decursinol angelate. The new concept of “comprehensive HPTLC fingerprinting” is proposed: HPTLC fingerprints (images), which are used for identification, are converted into peak profiles and the intensities of selected zones are quantitatively compared to those of the corresponding zones of the reference material. Following a collaborative trial involving three laboratories in three countries, the method was applied to check the quality of further candidates for establishing an appropriate reference material. In conclusion, this case demonstrates that a single HPTLC analysis can provide information about identity, purity, and minimum content of markers of an herbal drug. Different sources of HPTLC/TLC methods for identification of Angelica and related species (Table 1S), details of samples shown in [Fig. 2] (Table 2S), details of samples of A. gigas, A. sinensis, and A. acutiloba used in this study (Table 3S), the content of D+DA of HRMs of A. gigas, and SOP for the collaborative trial are available as Supporting Information.